In gastroresistant DR Caps™ for optimum efficacy. 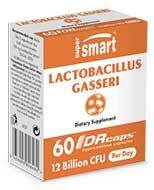 Each capsule contains 100 mg de Lactobacillus gasseri (3 billion micro-organisms). Berberine 500 mg60 Veg. Caps. Berberine 500 mgclose60 Veg. Caps. Adults. Take 2 or 3 capsules a day divided into two or three doses to be taken before the main meals of the day. Each capsule contains 500 mg berberine. Take three softgels a day at mealtimes. New patented curcuma extract, 29 times more bioavailable ! Adults. Take one to two vegetarian capsules a day at mealtimes or as advised by your therapist. Each capsule contains 500 mg of Meriva®. Contains soya derivatives. adults. Take two vegetarian capsules a day or as advised by your therapist.